Okay. I'm gonna share this with y'all 'cos you've stuck by me through the bad times and you deserve a little insight to help guide you along life's occasionally rocky highway. To make the perfect boiled egg every time, do NOT time the process. Instead, lift the egg periodically from the boiling water with a spoon (yes, the spoon *is* a good idea). When it's out, watch how fast the water evaporates off the egg shell. If it takes longer than 2 seconds, put the egg back in the water. When it takes a little less than 2 seconds, it is perfectly done - not too hard, not too soft. After you do this for a few years, you will become a master of the Art, like me. Hi Ken, that eggs look "yummy". I like soft boiled eggs with the yolk still juicy. Likewise with sunny side up eggs, I always leave the egg yolk half cooked. Hope your vacation is turning out well. That's great, Ken! I love eggs. I don't have a problem with boiled - I like them very hard-boiled, but it's poached eggs that seem to elude me. I really enjoy a good poached egg, but can never get that right. Thankyou for that, you truly are a soldier. OK, that was pretty random, there....Can't wait to hear the full story sometime! I was in Bintulul, Malaysia this past week and for breakfast I picked up a boiled egg. The captain (yes, I was on a vessel) told me it was a half boiled egg. I didn't fully understand what he meant until I tried to crack it. More like a quarter boiled if you ask me. Hello Ken, the keypads have a mind of their own; that should read: THAT EGG LOOKS YUMMY..( grins) sorry. Well I suppose... if you like your eggs runny.... personally I don't like eggs so for me to eat one boiled it has to be HARD boiled. But you know, maybe one day I'll have to cook an egg for someone who likes them like yours and then well... I'll be prepared. Just call me a girl scout. Personally I'd prefer you in drag as Nigella to the real thing. She's so obvious...I'm sure you'd have more subtlety! You got me with the picture, and I just had to read the post too. My favorite breakfast as a child! Do you serve toast soldiers with that? Matt: sorry, man, no fuller story to be had. As the man in the song said, "That's all she wrote...". 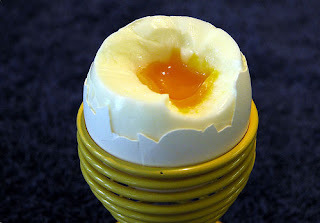 Cellobella: I like a hard boiled egg sometimes too... usually when my infallible method fails. Rachel: I *am* Nigella. You know this, deep down. Welcome back, Mate! Tell us about your holiday! Intriguing idea - I shall try it, just for the hell of it. That was one of the most unique tips I have ever read. I do like hard boiled eggs, so I believe this is going to come in handy. ...yes, using a spoon is a *great* idea. Good tip. I made buttermilk overnight pancakes last night (for this morning) so won't get the chance to try the egg boiling yet. If this works, I hope it will take me less than a year to master it. Thanks for the tip! Ok. So what's the best method for hard boiled eggs? Use the above method then... em... give it another while. "Use the above method then... em... give it another while." As far as I know blogger id cannot remove nofollow, but commenting using personal url, also in nofollow. Your blog does not follow the comments link, but you show the tag of "U Comment, I Follow" I think you should remove this tag or remove the logo. Blogger can remove 'Nofollow' but it has to be done manually by adjusting the html code as I have done (with some help). to check that I am still 'Dofollow' - as I am very keen to be - and everything seems to be in order. Please let me know if you find things to be otherwise and I will work quickly to get it put right. Put Your Damned Indicator On!